Senator Tom Coburn leaving politics - who will watch the waste now? Home Editorials Senator Tom Coburn leaving politics – who will watch the waste now? 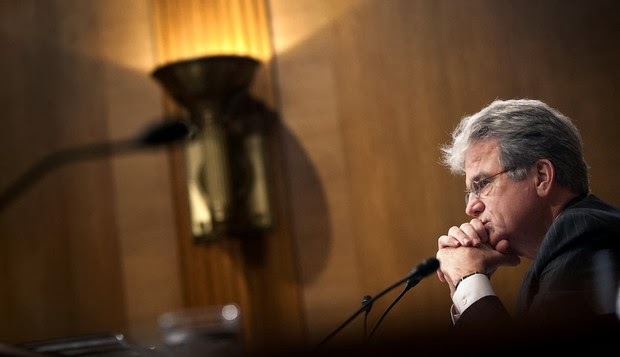 Senator Tom Coburn leaving politics – who will watch the waste now? You knew what might be coming when Senator Tom Coburn of Oklahoma announced in November that he had a recurrence of cancer. He managed for a long time with a triple threat — colon and prostate cancer and a benign brain tumor. He announced yesterday that he will leave at the end of this congressional session to spend the time he has left with his three children and seven grandchildren. It may be one of the only times when a politician says he wants to spend more time with his family and we know it is utterly the truth. … this decision isn’t about my health, my prognosis or even my hopes and desires. Coburn, nicknamed “Dr No” for his voting record in the Senate, was supposed to serve through 2016. Instead, he’ll step down in January 2015. He had already vowed not to seek a third term. Senate republican leader Mitch McConnell released a statement Thursday describing Coburn as “one of the most intelligent, principled and decent men in modern Senate history”. Known as a conservative maverick during his three terms in the US House in the 1990s, Coburn continued that role after being elected to the Senate in 2004. A fierce critic of what he described as excessive government spending, Coburn was most vocal about opposing the earmarking of special projects. His office routinely produced reports on wasteful spending, such as a 37-page report in 2011 dubbed Subsidies of the Rich and Famous that detailed nearly $30bn spent annually on government tax breaks and federal grant programs for millionaires…. There is more, and it IS an interesting read, here. (WASHINGTON, D.C.) — U.S. Senator Tom Coburn, M.D. (R-OK), ranking member of the Homeland Security and Governmental Affairs Committee, today released his annual oversight report “Wastebook 2013” highlighting 100 examples of wasteful and low-priority spending totaling nearly $30 billion. “While politicians in Washington spent much of 2013 complaining about sequestration’s impact on domestic programs and our national defense, we still managed to provide benefits to the Fort Hood shooter, study romance novels, help the State Department buy Facebook fans and even help NASA study Congress,” said Dr. Coburn. “Had Congress, in particular, been focused on doing its job of setting priorities and cutting the kind of wasteful spending outlined in this report, we could have avoided both a government shutdown and a flawed budget deal that was designed to avert a shutdown. The nearly $30 billion in questionable and lower-priority spending in Wastebook 2013 is a small fraction of the more than $200 billion we throw away every year through fraud, waste, duplication and mismanagement. There is more than enough stupidity and incompetence in government to allow us to live well below the budget caps. What’s lacking is the common sense and courage in Washington to make those choices — and passage of fiscally-responsible spending bills — possible,” said Dr. Coburn. “This report speaks volumes about why confidence in government is at an all-time low. The hard truth is we’d much rather borrow than cut. The American people are right to expect more,” said Dr. Coburn. To read the details of just this first entry – and many, many more – go over here. It should be obvious to anybody, that the current administration has NO idea how to manage Americans’ money (hard-earned dollars collected by the IRS by the way.) Now that Senator Coburn has announced his intention to leave, we need other voices raised to keep attention on the pigs at the trough.